I talked about koftas / keftas a decent amount in my last post so I won’t blab again. I had made a batch of Baked Moroccan Keftas and decided to use them to recreate a lovely brunch dish I had tried at Cafe Gitane: Spicy organic meatballs in turmeric tomato sauce with boiled egg, cucumber-yogurt and cilantro. 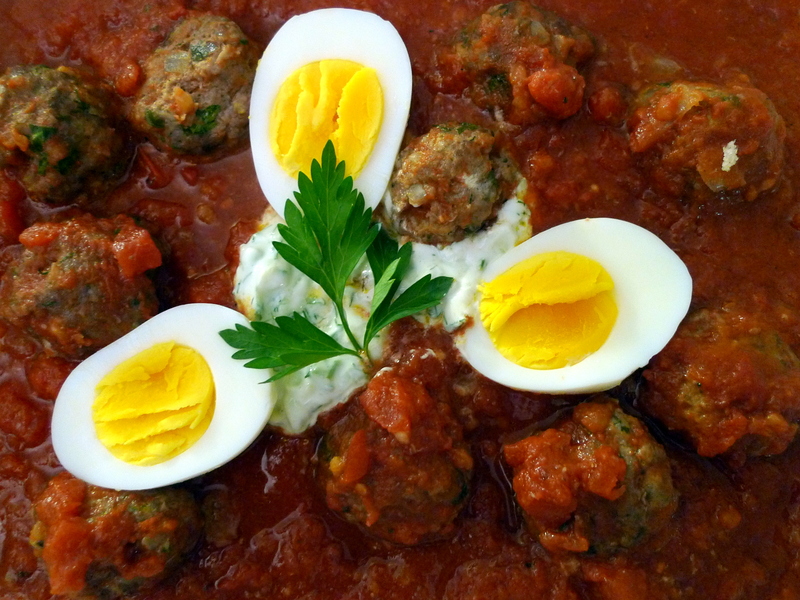 This dish is a take on the popular Moroccan Meatball Tagine, or Kefta Mkaouara (Mkawra). Seasoned meatballs are slow simmered with a spicy tomato sauce in a tagine, a special earthenware pot made entirely of heavy clay. Eggs are optional, but a classic addition to the tagine dish. They can be cracked straight into the sauce and cooked until the whites have just set, but I chose to follow Cafe Gitane’s version and placed some boiled egg halves before serving. I also loved the refreshing addition of the cucumber yogurt, which I interpreted to be Tzatziki. The heat and spice from the sauce was tempered by the cool and creamy tzatziki; a very delicious pairing. To create this dish, I borrowed elements from recipes on epicurious and Al-Ahram Weekly. It was a lot of fun recreating the Cafe Gitane dish at home, and it was even more fun eating it! It was easy to make and quite economical as well, which is always key. Make one batch of Baked Keftas. Start by mixing all the kefta ingredients together in a large bowl and let rest for about 1 hour to allow the flavors to blend. Now, you can start making your turmeric tomato sauce. In a large pot (unless you happen to own a tagine), heat the olive oil and fry the garlic and onions until fragrant. Stir in the ground turmeric, coriander, cumin, tomato paste, and tomatoes. Bring to the boil and simmer covered over low heat for 20 minutes. 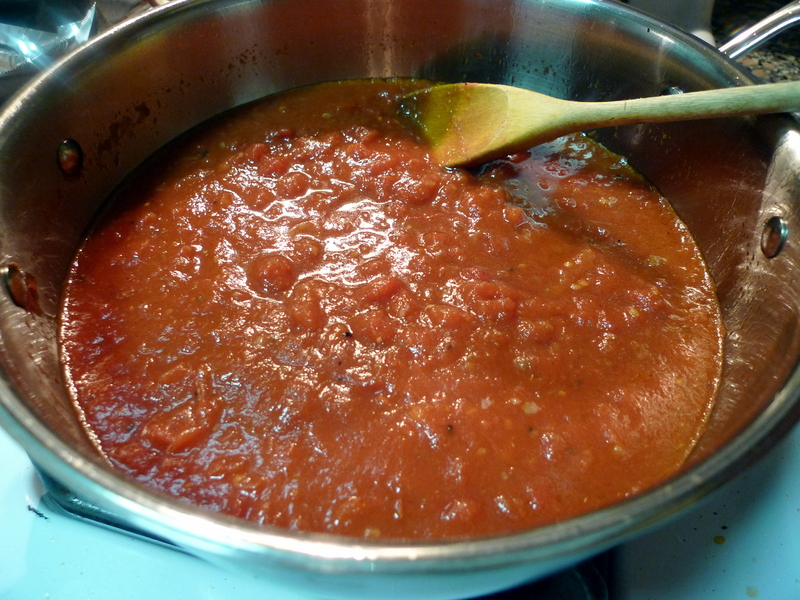 While your sauce is simmering, you can roast the keftas so they will be ready to add by the time the sauce is almost done and both will finish cooking together. Gently add the keftas to the sauce and let simmer for another 15 minutes. 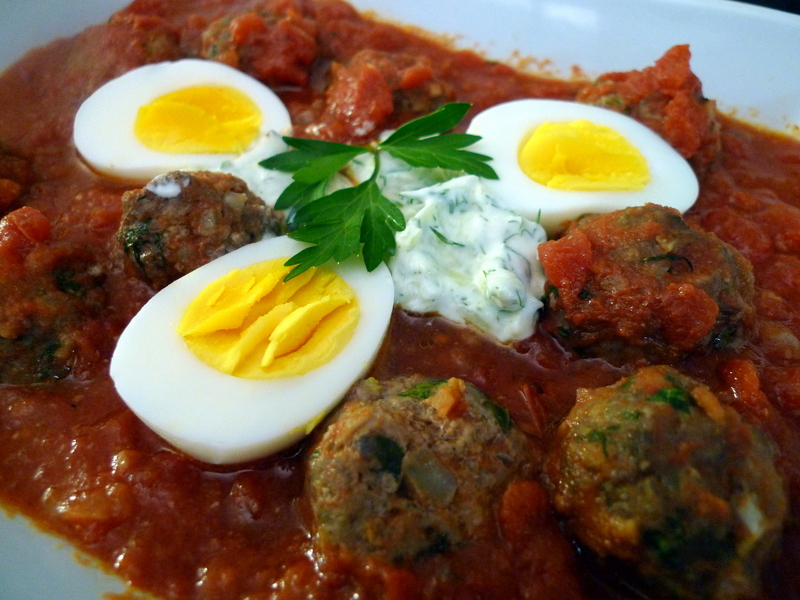 I modeled my preparation of this dish after Cafe Gitane’s Spicy organic meatballs in turmeric tomato sauce with boiled egg, cucumber-yogurt and cilantro. I ladled a hefty serving of the keftas in the tomato sauce into a shallow bowl. I made a fresh batch of tzatziki to spoon into the sauce, placed a few hard-boiled egg halves around the dish, and finally piled some fresh cilantro sprigs on top. Voilà! Enjoy with some warm, crusty bread. 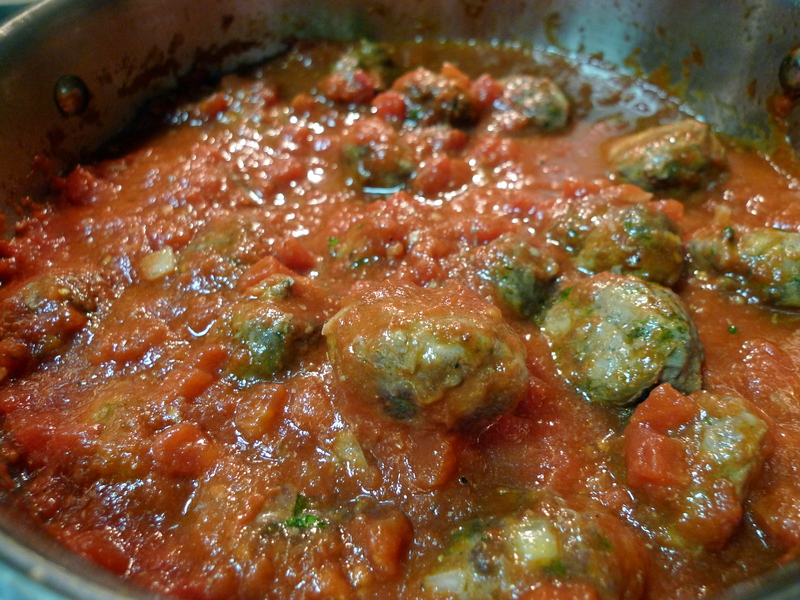 Great way of using those meatballs – they look fantastic! haha anytime! peeked at your blog — beautiful painting! 🙂 Those keftas look fantastic! Thanks for stopping by!